The pitch for THREEDOM is pretty simple: What are well known improvisers like when they’re just hanging out? Anyone who has ever listened to Paul F. Tompkins, Lauren Lapkus, or Scott Aukerman guest on each others’ podcasts has undoubtedly felt a warmness radiate—it’s that quality that makes their collective appearances together so successful and loose. 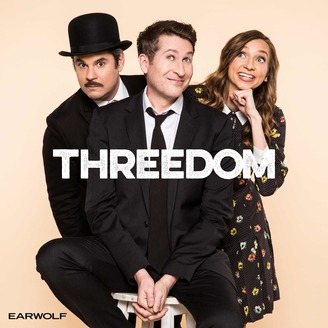 But, as could be inferred, the trio’s friendship exists well beyond the mics, with Tompkins and Aukerman stretching back to the days of MR. SHOW and Lapkus joining the COMEDY BANG! BANG! live crew. THREEDOM, available exclusively on Stitcher premium, is an attempt to peek behind the curtain to hear what the three are like together outside of the world of improvising, and unsurprisingly, it’s a riot. THREEDOM is relatively formless, and it’s all the better for it. In structure it hearkens back to the days of hot talk morning radio, though it’s less topical in its delivery (the episodes, at least through the current stretch, have been in the can for some time) and more focused on personal storytelling. The show’s linchpin is Lapkus, whose relationship with Tompkins and Aukerman is newer and allows for older stories to find new tread in group discussion. Just as you would if you were behind the mic with your friends, the goal, first and foremost, is to have fun. Those low-stakes mean the show moves quickly, bouncing from story to story. From stories about Thompkins getting arrested for smoking on a train, to Auckerman getting a head injury during a rubber band fight, or Lapkus trying to dodge a freeloading friend, the podcast’s collective train of thought moves from quips and anecdotes to full-on analysis and back in the blink of an eye, never lingering on a topic for very long. The only quote-unquote “segment” of the show comes in the final quarter, when the hosts play verbal parlor games with each other like “Duck, Marry, Kiss” (quickly determining if a listed name is a famous duck, famous Marry, or a member of the band KISS) or “Switch It and Pitch It” (taking turns pitching “opposite” TV shows, i.e. pitching what would happen on a show like APARTMENT DESTRUCTION, a flip on HOME IMPROVEMENT). The games are equally flippant, sounding like friends passing time on a road trip, and delight in their simplicity and act as a nice end cap to the episodes. THREEDOM is delightful, funny, and revealing, a talk triangle that serves as a peek behind the curtain of comedians who we’ve spent years getting to know through their work and not their personal lives. The chemistry between the three has always been electric, and through their latest podcast, we can finally understand why. For fans of any of these comedians, it’s a must listen. CJ Simonson is Crossfader's music editor and the creator of Merry-Go-Round Music. The only thing he knows for certain is that "I Can Feel The Fire" by Ronnie Wood is the greatest closing credits song never used in a Wes Anderson movie. Get on that, Wes. Podcast of the Week: RISK!